BAT - BLOG : BATMAN TOYS and COLLECTIBLES: DC COMICS x JUSTICE LEAGUE French OASIS Soda Pop Cans = AWESOME! DC COMICS x JUSTICE LEAGUE French OASIS Soda Pop Cans = AWESOME! DC Comics has teamed-up with the OASIS Soda Pop Company in France to bring beverages with "Justice League Superhero" graphics to stores. 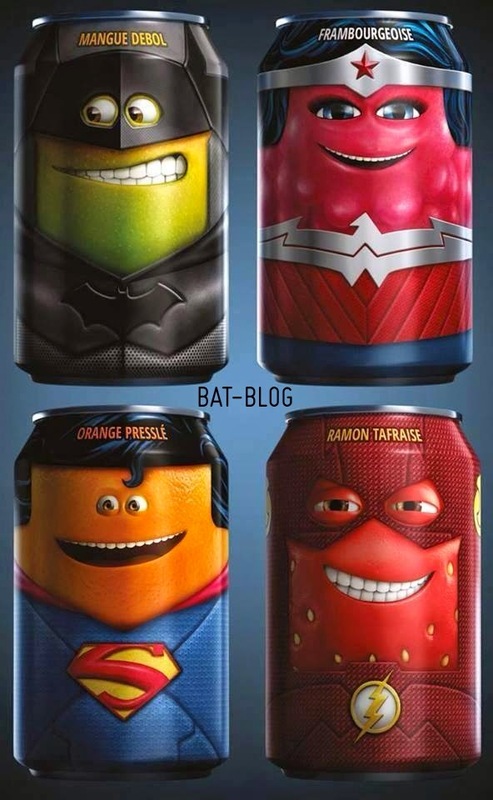 It looks like Batman is Lemon-Flavored, Superman is Orange, Flash is Strawberry, and Wonder Woman is maybe... Raspberry? Anyhow, here's a video, totally in French, that shows an unveiling of the product. Now, I think this "BOX" is only available to people who the PR company mailed these to. I'm not sure yet. I say that because a year or two ago Mountain Dew sent me a similar package for their "Batman Drink". But either way, these cans are a lot of fun! Oh man, I really really want the BATMAN can, ha ha!